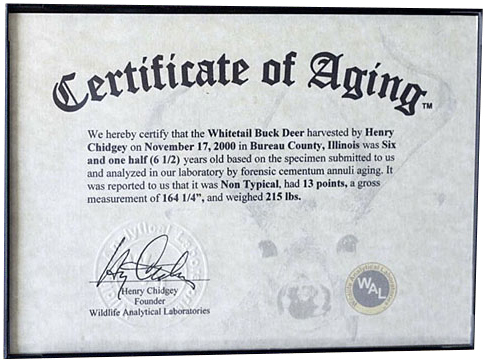 Learn how to forensically age your own deer, 2 years old or younger! Deer aging video. Watch Henry Chidgey on YouTube show how to do this. “Wow, he’s huge!”, “I wonder how old he is?”, “She looks old, how old do you think she is?”, “I wonder how many years that old boy has been around here?” The list goes on. One of the challenges hunters like I have had over the years is knowing, for sure, how old the deer they harvested was. I had bought all the books, wall charts, and aging wall plaques that promised to teach and show an exact way of aging based on looking at the molars in a deer’s jaw. Well, this seemed to work well for fawns and 1 ½ year olds, because the number and type of teeth seemed to accurately place these age classes. But beyond that, my confidence that what the charts, books, and “experts” told me could be accurately applied to the jaw I had in my hand was very low. Later, I discovered three new pieces of knowledge. The first was that there had been formal studies done by two different organizations/ researchers to verify the accuracy (or lack thereof) of aging deer by looking at the molars and their wear. The second was that there was a physiological mechanism that occurred in all mammals every year. A layer of cementum is deposited around the portion of the teeth located beneath the gum. In addition to this there was and is a forensic laboratory method that allows histologists to prepare these teeth so that the rings of cementum can be counted under a high powered microscope as easily and accurately as counting the growth rings of a tree. So let’s look into these bits of new knowledge in more depth. First, the studies revealed that the molar wear technique did not work, even for trained experienced wildlife biologists that had looked at thousands of deer. In the Journal of Wildlife Management 64(2):441-449 Kenneth Hamlin and 4 other wildlife professionals from the Montana Fish, Wildlife, and Parks concluded (based on a study of 53 known age mule deer and 21 known age whitetail by eruption-wear and 108 known age mule deer and 74 known age whitetail by cementum annuli) “The accuracy provided by the cementum annuli method is necessary to determine whether various physical and population parameters change significantly with age of the animal…. Ages assigned by eruption–wear criteria were not reliable for comparing physical measurements and population parameters by age among populations…. Accuracy for a sample of known-age mandibles aged by eruption-wear criteria was 62.3% for mule deer, 42.9% for whitetails, and 36% for elk”. “The accuracy for individual biologists ranged from 54.7-71.7% for mule deer and 23.8-66.7% for whitetail deer” “This aging was done by 4 biologists from Montana and 2 from Washington considered to be experienced in aging deer used eruption-wear to age these mandibles…”. Cementum annuli aging yielded a 92.6% accuracy rate for mule deer (with no error over 1 year), 85.1% accuracy rate for whitetails (only 2 in error over 1 year) and 97.3% accuracy rate for elk. Dental cementum grows continuously during an organisms’ lifetime without reabsorbing (as bone and other dental tissues like dentine and enamel do). This means that dental cementum offers a complete record of individual growth. For this reason, dental cementum is particularly interesting to archaeologists. Dental cementum is a mineralized tissue closely related to bone. Both are composed of approximately 65% inorganic components and about 35% organic components, with relatively few cells per volume/mass of mature tissue. Cells in cement, cementocytes, are secreted by cementoblasts embedded in the tissue. The organic matrix which forms the basic structural component of bone and cement is composed of collagen fibres. Cementum growth, or deposition, is most simply described as a two-phase process: the first phase is the production of the organic matrix, followed by the mineralization phase. Growth is appositional and results in a banded structure, implying the existence of structural variations in the deposited tissues. The layering observable in dental cementum corresponds to the presence of growth layers, composed of growth zones, annuli and lines of arrested growth, or LAGs. A number of possible explanations for the optical and physical expression of growth layers in bone and cement have been offered: changes in mineral density; cellular density; histochemical differences; and collagen fibre orientation. Organization of the collagen fibre matrix is currently believed to be the source of the observed major structural variations between growth layers. Biologists have investigated growth marks in a wide variety of vertebrate species from different environments. They have empirically identified a yearly cycle of cementum formation, consisting generally of a single paired growth zone + annulus/LAG. These empirical observations, based on studies of control groups of animals of known age and season at death, are supported by experimental studies involving the use of fluoromarkers as “benchmarks” to record the position of cement growth at precise intervals. The fact that several different types of bony tissue form incremental lines in synchrony, i.e., dentine, cement and periosteal bone, supports this identification. So, we now know what cementum is and that there is a forensic laboratory histological process that allows us to accurately determine the length of time a tooth has been in a mammal’s mouth. We also know that most all mammals (humans too!) deposit discrete layers of cementum around the portion of the tooth located beneath the gum line. If you carefully slice the tooth in thin sections, stain these sections, and place them on a slide under a high power microscope, you can then count the rings (annuli) of cementum and know the length of time that tooth was in that deer’s jaw. It is just like counting the rings on a tree to determine it’s age. The teeth we choose to use in a deer’s mouth for aging are the two front center teeth (center incisors). The reason for this choice is that these teeth are in place by the time the fawn is 4-6 months old and remain in place through out the deer’s life. These teeth and the first molar are the first permanent teeth a fawn gets. The center incisors are much easier to remove than a jaw bone and especially a molar out of the jaw bone. So, forensic cementum annuli aging is typically performed on the two center incisors, but may also be performed on the M1 molar, the fourth tooth from the front of the 3 premolar, 3 molar teeth in a mature whitetail’s jaw. The next part of this story is what I did next, armed with these new tidbits of knowledge. I went searching for a lab to age my trophies. What I discovered was that there was only one private (not government or University) lab that did this commercially. Also, none of the labs seemed to be focused on quick reliable turn around. So I tried a lab (actually a middleman that used another lab) and was disappointed by the way the results were reported and the length of time it took to get the results. I sent the four specimens in the first week of February and received a call on July 18th in which I was told the results over the telephone. No e-mail, fax, or letter confirming the results, just a phone call and it took over 5 months. Well, I decided that if someone was going to meet the needs of clients like me, I was going to have to do it. So, with the invaluable assistance of two longtime friends Dr. Mike Lavelle & Dr. Maureen Steinwall, I obtained every research paper I could find on cementum annuli aging of any mammal, engaged an experienced histologist, set up a well equipped laboratory, and created Wildlife Analytical Laboratories—Home of www.DeerAge.com , to meet the needs and desires of clients like myself. Those needs are- Accuracy of Results and Great Customer Service. We have developed service offerings targeted for and now serve Ranchers, Wildlife Stewards, & Hunters Worldwide. We age any game mammal from anywhere on the planet quickly and at a low cost. So, What is a REAL Trophy Whitetail? Depends, but for me it is that whitetail doe or buck who has successfully eluded predators and hunters for many years, taken with the most challenging weapon I have proficiency with. That is the buck or doe that goes up on my wall, with a Certificate of Aging™ right next to it. Equally as important, I want to keep developing and fine tuning my skills at aging my deer before I squeeze the trigger or loose the arrow. That’s why I will be a lifelong student of aging. How I will do that is to forensic cementum age every deer I harvest and compare their actual age to what I estimated before the harvest. I am committed to mastery of this important whitetail management skill.